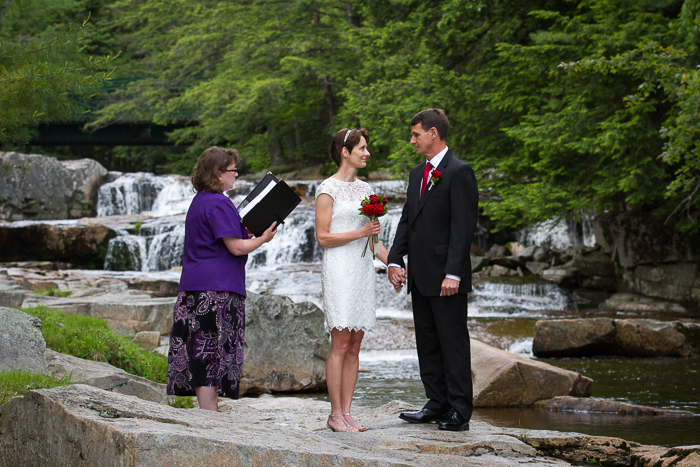 A Quiet Time for an Elopement is now…Before school vacation! Looking for a quiet time to escape and tie the knot? These may be your last two weeks before Jackson Falls has an array of summer time splashers. We were the only ones at the falls this past Tuesday night! Hard to believe, we all commented how quiet it was. I must say this makes taking photos a LOT easier too! They picked a great time of day for their ceremony as well. 6pm – so there was nice soft late day sunlight. Kim The JP officiated and they stayed at the Inn at Ellis River. Stay tuned for more photos in coming days!